24” x 17” Rust over-dyed fabric in a mirror image of Wilderness Trails I. 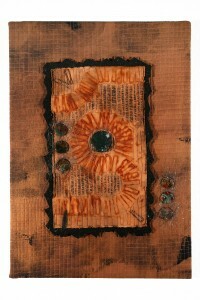 Materials include: discharged and rust-dyed fabrics, paintstiks, agate and found objects, Angelina fibers. Layered, machine stitched, and stretched on a frame.